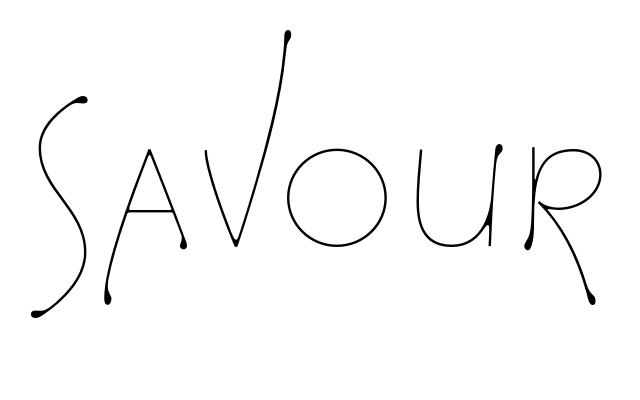 Entyqua, the featured shop of the day, is mostly a handmade jewelry store, although you will find a few miscellaneous items from time to time. Like these fun and fresh button barrettes! 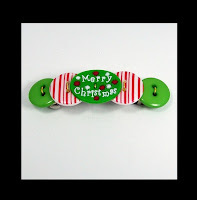 This Merry Christmas barrette has juicy green apple buttons and candy cane striped buttons flanking the very merry center button. 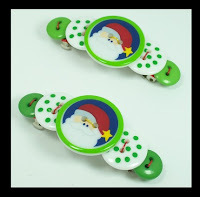 The Santa set has the same vibrant green buttons and some spotty green and white buttons around a sweet Santa face. These would make great stocking stuffers, although it's getting a little late if you want them in time for the 25th! If you hurry and ask for express shipping, you might be lucky though ~ although getting a gift after Christmas is just as fun as the day of! I mentioned that Entyqua was mainly a jewelry store, and this is because, Becki, the creative mind behind these shops, just opened a new shop! 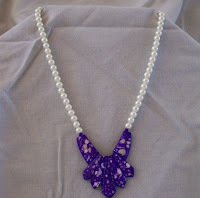 Check out delightful deceits for cards, jewelry boxes... and coming soon, a clothing line and hair accessories. 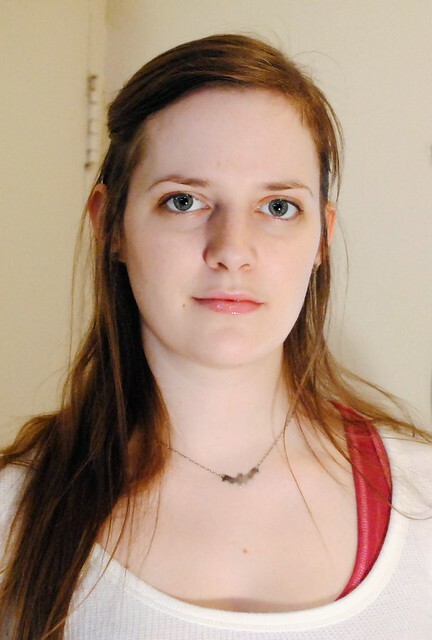 As for the jewelry making, Becki started making earrings around 5 years ago. She eventually expanded into other pieces, and just take a look through Entyqua to see her talent! Becki is a stay at home mom to one little girl, and has many hobbies, as you can tell by the wide range of products in her two stores! Here are a few of my favourites, starting with symmetrical geometrics. Wow, I might like math and be a science geek, but that was hard to say even for me! But this necklace certainly isn't hard to look at ~ in fact, people will be unable to take their eyes off its sparkle. If you want a bit of attention, this is a piece for you! 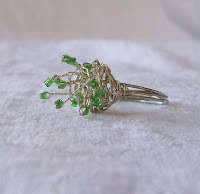 Speaking of grabbing attention, look at this electric wire wrapped ring! 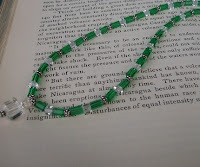 I love how the grass green seed beads are wrapped ~ they look like tiny sprouts germinating. Which really makes this a great ring to wear into spring and summer!! What a great gift!! Oh!! Did I mention there was a clearance section? Well this little number is 40% off!! Get crystal drops while you can!! 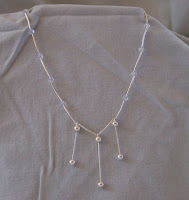 The simple, classic design makes for a very versatile necklace. This piece would be perfect for a New Year's Party, and dinner on New Years Day. Ok, ok, one last piece, I promise... then you can go choose your own favourites! This speckled fan necklace reminds me of falling snow, in the evening when the sky gets this stunning royal blue. And the pearl necklace just adds to the snow illusion, making for truly breathtaking piece of jewelry. As you can see, I was sticking to a bit of a Christmas-y theme again ~ there's way more in store! All the designs you find in Entyqua are completely handmade, unique and will never be recreated. 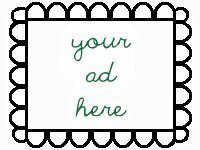 Becki loves doing custom work, so don't be shy to send her a convo to tell her what's on your mind (or to let her know you need a size adjustment). You can also find Becki on MySpace and her blog, where you'll find more features of the great artists in this challenge! Great feature; very nicely done!